It’s that time of year when gardeners get antsy and start thinking about their gardens for the coming year. You could start seeds indoors, but why spend money on lights and power or time maintaining them when you could winter sow outside with very little effort? Winter sowing has a lot of advantages over traditional indoor seed starting. No supplemental lighting is necessary, nor excess electricity used to run them, so it’s less expensive. Seedlings started using this method are stronger and hardier than those grown on a windowsill and don’t require any hardening off when the weather warms up. Perennial seeds with tough outer coatings don’t require any scarification to start germination. Winter sowing works by creating tiny greenhouses that trap the sun’s heat and creates a warm pocket inside for seeds to grow, so you can set and forget. So how do you use the winter sowing method? Start in February for perennials, March for cold-hardy vegetables like spinach, cabbage or peas and April for tender annuals that you normally wouldn’t put out until last frost. Typically a gallon milk jug is used, but you can get creative; an ice cream bucket would be another good choice. You’ll also need seeds, potting soil, a sharp knife or scissors, duct tape and a waterproof marker. If using a milk jug, you’ll want to draw a line halfway up the jug around the circumference. Cut the jug along this line, leaving a small amount attached by the handle - this will be your hinge. Be sure to cut a few holes in the bottom of the jug as well to allow for drainage. Open the jug and fill with potting soil. I find it helpful to dampen the potting soil a little before placing the seeds on top. Don’t worry too much about spacing, as the seedlings will all be transplanted out later and can be thinned at that time. Then cover your seeds to the depth written on the seed packet and gently tamp the soil down. Moisten the soil, being careful not to wash the seeds away in the process. A spray bottle filled with water works well. 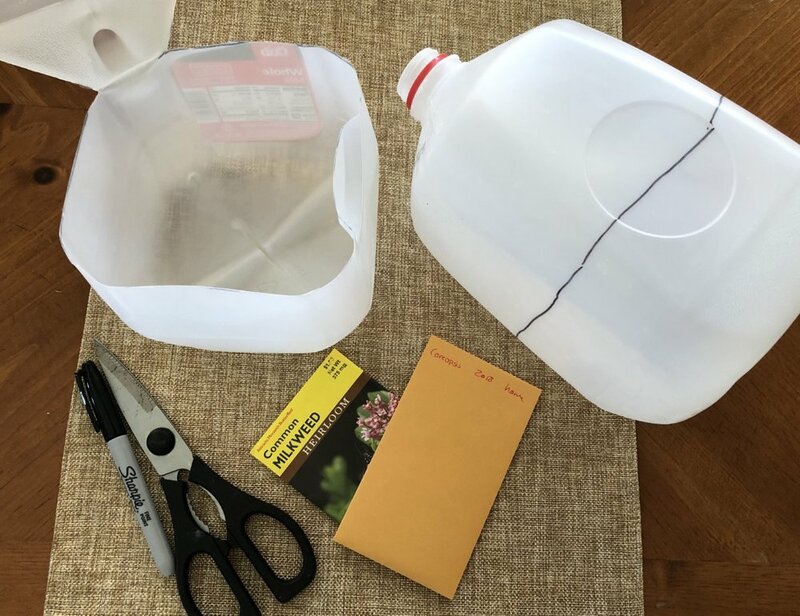 Close the jug again and tape shut, but discard the cap from the bottle - this will be the vent of your ‘greenhouse’ that allows everything to breathe. Lastly, be sure to label the jug with whatever seeds you just planted! Place your milk jugs or other containers outside in the sun. They should be out of strong winds but in a place that will let rain, snow and sun in freely, so not under an overhang. A southern exposure is best, but a western exposure for afternoon sun is also acceptable. On warm days in April you can open up the jugs to let the plants get more exposure, but be sure to close them up again at night if the temperatures are still dropping below freezing. Plants can be transplanted out to your garden when appropriate for the seeds you planted.